As a child, I would wake up on Chinese New Year to find two red envelopes from my parents tucked under my pillow with a mini embroidered cheong sam by my bedside. Chinese New Year, with all its festivities and traditions, continues to be my favorite holiday of the year—it was my excuse to dress like a little Chinese doll for an entire day without feeling self-conscious and out of place. Whether I’m 5, or 22, in Asia or the U.S., I still manage to incorporate oriental accents into my wardrobe on Chinese New Year. When it comes to Asian fashion fusion, Shanghai Tang is best at artfully integrating oriental influences into western fashion by focusing on subtle touches that make a big statement. This particular Shanghai Tang coat completed my chilly Chinese New Year ensemble. 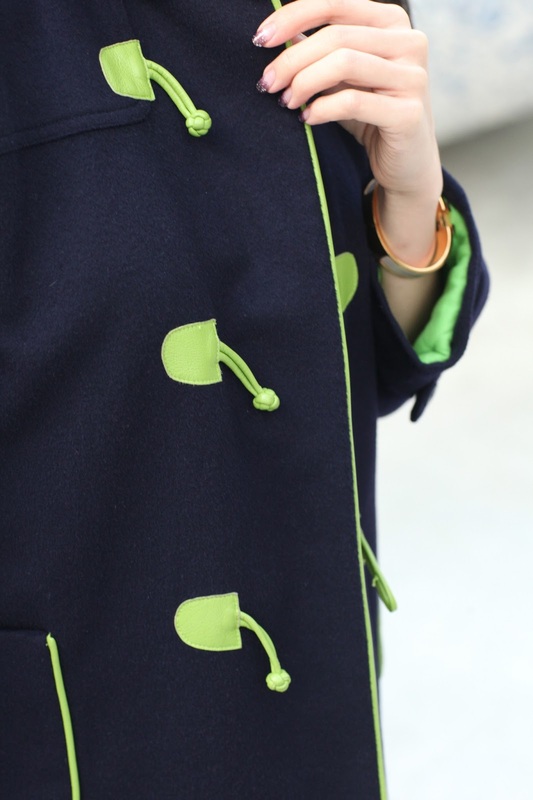 With Asian influences taking center stage this Fall and Spring, I was more than happy to trade in my otherwise boring outerwear for a coat with a traditional mandarin collar, leather knotted buttons, angular edges, and neon green leather piping! Hi! :) Thank you for reading! I credit my mother for the shoes! She picked them out for me and sent them to LA a couple of months ago!